After a week of feeling up and down and lacking in get up and go, I was woken by my youngest granddaughter Alexis age four, Facetiming me and asking if she could come to the football instead of Laura. Well that melted my heart and jolted me into action. It’s surprising what a little bit of love can do! I was unable to attend the funeral of our oldest Leeds United fan Edna Newton yesterday, but heard she got a great send off with lots of Leeds fans turning up as well as her family. There was also a lovely touch from the club with their wreath which was placed at Billy’s statue after her funeral. With Bremner Square around Billy’s statue now even larger with more stones in place, we headed there straight away and it looks fantastic, with lots of memories for so many fans now. It was nice to meet up with some fans from the Isle of Man there who regularly read my blogs and they will now have their photo in this one. On our way to the Peacock, I remembered that someone from work wanted a programme as her dad should be in it. On stopping at Phil Beeton’s cabin, we bumped into some of our Norwegian fans who had come over for the game. When I took a photo, I hadn’t realised at that time it was Phil’s birthday. 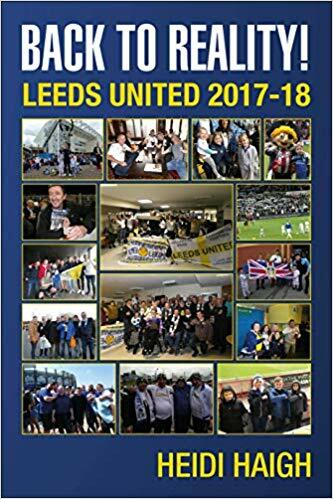 I hope he enjoys reading my new book Back to Reality, Leeds United season 2017-18 that his wife Chris brought for him as a surprise. I’d had a great surprise during the week when my neighbour Keith had brought 10 of the same book at once. When Tony came up to me as I passed him on Lowfields Road later, he’d said “guess what I got for my birthday?” His son had bought two of my books for him. As usual my grateful thanks go to them for their support. I also caught up with Simon plus some more of our Norwegian fans and Jørn from Denmark in the Peacock. Leeds had sold out all the tickets for the home support once again for this game. After the international break last weekend, it felt ages since we’d played. With more serious injuries for members of our squad with the broken leg for Blackman plus Jansson and Peacock-Farrell being out, this meant a couple of our youngsters coming into the team today. This was: Will Huffer in goal for his debut, Cooper, Phillips, Dallas, Alioski, Roofe, Forshaw, Klich, Douglas, Aapo Halme making his first appearance at centre back and Hernandez. Subs were: Harrison for Alioski (61), Saiz for Halme (64) and Baker for Klich (82). Leeds won 2-0 with goals from Roofe (69) and Hernandez (86). Attendance was 34,333 with 889 Bristol City fans. Someone had asked me how I thought we’d play and I said I’d no idea but needed a win. The good thing about Huffer being in goal was that the whole squad including the under 23s are all trying to play the same game, so he should be fine. The first half saw Leeds have a lot of possession but the one thing that wasn’t happening were shots on goal. Their keeper to begin with looked very shaky and I felt that we needed to put him under pressure. Although the game was at a steady pace, I didn’t think Bristol offered too much although they had a good chance when the ball came to one of their players on the edge of the area but his shot was wayward. We’d had a shot on target and should have done better with at least a couple more. The two young debutants were playing well, doing what they had to do and playing it safe despite a couple of hairy moments. Bristol had a couple of patches putting us under pressure but I thought we coped with them very well. My only fear was that déja vue moment of us having lots of the ball and them breaking away to score, but the score was even as we went in to the break. The second half started off as it had been left at the end of the first half. I felt that we needed to freshen things up at that time but then the Leeds fans came into their own once more and became the 12th man. The South Stand started with the Klich song “It could be 20 yards or 30 yards, everywhere we go, 40 yards or 50 yards, Klich will score a goal, Klich will score a goal!” With the Kop joining in, this upped the atmosphere and had an immediate effect on the players. Not long after, their player fouled Roofe in the middle of the park and got a deserved booking. The next thing I saw the red card out as he was sent off. I hadn’t realised he’d already been booked and despite his manager saying at the end of the game that the ref had been swayed by the crowd, he deserved to go. The ref had been almost invisible for a lot of the game because for once he let the game flow a lot, well most times! The team upped the tempo and then Bielsa made two subs within a few minutes of each other with Harrison and then Saiz coming on. As someone shouted “we can’t keep trying to walk the ball into the net”, it wasn’t long before we got the goal to put us into a well-deserved lead when Roofe scored from close range. At that time I didn’t expect us to do anything else but win the game. We had a lot of pressure but then Bristol had a spell where they won a couple of corners and attacked us. I didn’t feel worried though because we dealt with the threats before taking the impetus again. After Saiz put a great cross in for Hernandez to head the ball into the net for our second goal, that was it game over. A win and three points were gratefully received thank you. When the subs were being made earlier, I’ve no idea what was happening with the person putting the numbers up. On one of my photos Bielsa looks to be angry about something so no doubt we’ll find out in due course. Onto our second home game in a few days when we play Reading on Tuesday. Whether any of our injured players come back by then I don’t know, but I’m sure our youngsters will fit in just fine. See you then – LUFC – Marching on Together!